Waking Green Dragon: A Night with the Big APL: Visa or Mastercard? Woke up at 5:30 and puttered for a while. Got to the Laundromat a little after seven and used the washer and dryer so my stuff would be clean and dry for the movers on Thursday! Cathy and I worked on tones and syllables for 45 minutes after I had a nice good-bye with Secretary of State Bill Gardner. Handed over the keys to the Project Laundry List office after a 1.5 hour meeting with a board member and our bookkeeper. Left Concord at 3:40 PM after the official letter of invitation arrived by UPS and I am now in New York City so I can be at the consulate at 9 AM to get my Visa. Rolled into town a tad before 9 PM. My friend and I went to The Ear Inn, first, which got its name because the owners wanted to avoid the hassle of getting permission for a new sign. It used to just say Bar. I had trout and horseradish. The waitress was Chinese from some unpronounceable city in the southeast of China. The food was mezzo mezzo. New York in the Gay Nineties had almost everything, except for a place where an opera lover, after a night of Verdi or Puccini, could relax, play a Neapolitan card game called "scopa" and drink a cup or two of espresso. This situation was remedied when our great grandfather, Enrico Scoppa and my great grand-uncle, Antonio Ferrara, opera impresario and showman, opened a cafe called Caffé A. Ferrara. Caruso thought the coffee marvelous but especially loved the cookies and cakes. I had three kinds of sorbet--passion fruit, mango, and guava--and a raspberry flavored cappuccino. Full? Hardly! 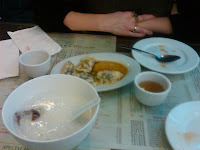 We then went to the Great NY Noodle Town where I had congee with duck (of course). Doesn't it look good? My gracious guide had steamed shrimp dumplings. Now I was full, but who does not have a weakness for shawarma? We went to Mamouns Falafel Restaurant and I had a sandwich without the bread. They looked at me like I was speaking Greek. The Slovakian tour guide-ess knew just where to go and now it is time for bed, because a little confused cuisine awaits at Nusbaum & Wu (on the Upper West Side). Bagels with wasabi? Meeting at 7:30 AM with a Barnard student from Changchun and Jonah Phillips' mother.